The lymphatic system is part of the vascular system and an important part of the immune system, comprising a large network of lymphatic vessels that carry a clear fluid called lymph (from Latin, lympha meaning "water") directionally towards the heart. The lymphatic system was first described in the seventeenth century independently by Olaus Rudbeck and Thomas Bartholin. Unlike the circulatory system, the lymphatic system is not a closed system. The human circulatory system processes an average of 20 litres of blood per day through capillary filtration, which removes plasma while leaving the blood cells. Roughly 17 litres of the filtered plasma is reabsorbed directly into the blood vessels, while the remaining three litres remain in the interstitial fluid. One of the main functions of the lymph system is to provide an accessory return route to the blood for the surplus three litres. The other main function is that of defense in the immune system. Lymph is very similar to blood plasma: it contains lymphocytes. It also contains waste products and cellular debris together with bacteria and proteins. 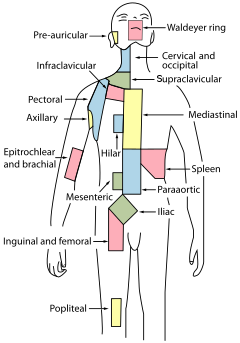 Associated organs composed of lymphoid tissue are the sites of lymphocyte production. Lymphocytes are concentrated in the lymph nodes. The spleen and the thymus are also lymphoid organs of the immune system. The tonsils are lymphoid organs that are also associated with the digestive system. Lymphoid tissues contain lymphocytes, and also contain other types of cells for support. The system also includes all the structures dedicated to the circulation and production of lymphocytes (the primary cellular component of lymph), which also includes the bone marrow, and the lymphoid tissue associated with the digestive system. Tertiary lymphoid organs (TLO) are abnormal lymph node–like structures that form in peripheral tissues at sites of chronic inflammation, such as chronic infection, transplanted organs undergoing graft rejection, some cancers, and autoimmune and autoimmune-related diseases. TLOs are regulated differently from the normal process whereby lymphoid tissues are formed during ontogeny, being dependent on cytokines and hematopoietic cells, but still drain interstitial fluid and transport lymphocytes in response to the same chemical messengers and gradients. TLOs typically contains far fewer lymphocytes, and assumes an immune role only when challenged with antigens that result in inflammation. It achieves this by importing the lymphocytes from blood and lymph. The spleen synthesizes antibodies in its white pulp and removes antibody-coated bacteria and antibody-coated blood cells by way of blood and lymph node circulation. A study published in 2009 using mice found that the spleen contains, in its reserve, half of the body's monocytes within the red pulp. These monocytes, upon moving to injured tissue (such as the heart), turn into dendritic cells and macrophages while promoting tissue healing. The spleen is a center of activity of the mononuclear phagocyte system and can be considered analogous to a large lymph node, as its absence causes a predisposition to certain infections. Lymphoid tissue associated with the lymphatic system is concerned with immune functions in defending the body against infections and the spread of tumours. It consists of connective tissue formed of reticular fibers, with various types of leukocytes, (white blood cells), mostly lymphocytes enmeshed in it, through which the lymph passes. Regions of the lymphoid tissue that are densely packed with lymphocytes are known as lymphoid follicles. Lymphoid tissue can either be structurally well organized as lymph nodes or may consist of loosely organized lymphoid follicles known as the mucosa-associated lymphoid tissue. The central nervous system also has lymphatic vessels, as discovered by the University of Virginia Researchers. The search for T-cell gateways into and out of the meninges uncovered functional meningeal lymphatic vessels lining the dural sinuses, anatomically integrated into the membrane surrounding the brain. Lymphedema can also occur after surgical removal of lymph nodes in the armpit (causing the arm to swell due to poor lymphatic drainage) or groin (causing swelling of the leg). Conventional treatment is by manual lymphatic drainage and compression garments. Two drugs for the treatment of lymphedema are in clinical trials: Lymfactin and Ubenimex/Bestatin. There is no evidence to suggest that the effects of manual lymphatic drainage are permanent. Cancer of the lymphatic system can be primary or secondary. Lymphoma refers to cancer that arises from lymphatic tissue. Lymphoid leukaemias and lymphomas are now considered to be tumours of the same type of cell lineage. They are called "leukaemia" when in the blood or marrow and "lymphoma" when in lymphatic tissue. They are grouped together under the name "lymphoid malignancy". Lymphoma is generally considered as either Hodgkin lymphoma or non-Hodgkin lymphoma. Hodgkin lymphoma is characterised by a particular type of cell, called a Reed–Sternberg cell, visible under microscope. It is associated with past infection with the Epstein-Barr Virus, and generally causes a painless "rubbery" lymphadenopathy. It is staged, using Ann Arbor staging. Chemotherapy generally involves the ABVD and may also involve radiotherapy. Non-Hodgkin lymphoma is a cancer characterised by increased proliferation of B-cells or T-cells, generally occurs in an older age group than Hodgkin lymphoma. It is treated according to whether it is high-grade or low-grade, and carries a poorer prognosis than Hodgkin lymphoma. Hippocrates, in the 5th century BC, was one of the first people to mention the lymphatic system. In his work On Joints, he briefly mentioned the lymph nodes in one sentence. Rufus of Ephesus, a Roman physician, identified the axillary, inguinal and mesenteric lymph nodes as well as the thymus during the 1st to 2nd century AD. The first mention of lymphatic vessels was in the 3rd century BC by Herophilos, a Greek anatomist living in Alexandria, who incorrectly concluded that the "absorptive veins of the lymphatics," by which he meant the lacteals (lymph vessels of the intestines), drained into the hepatic portal veins, and thus into the liver. The findings of Ruphus and Herophilos were further propagated by the Greek physician Galen, who described the lacteals and mesenteric lymph nodes which he observed in his dissection of apes and pigs in the 2nd century AD. In the mid 16th century, Gabriele Falloppio (discoverer of the fallopian tubes), described what is now known as the lacteals as "coursing over the intestines full of yellow matter." In about 1563 Bartolomeo Eustachi, a professor of anatomy, described the thoracic duct in horses as vena alba thoracis. The next breakthrough came when in 1622 a physician, Gaspare Aselli, identified lymphatic vessels of the intestines in dogs and termed them venue alba et lacteal, which is now known as simply the lacteals. The lacteals were termed the fourth kind of vessels (the other three being the artery, vein and nerve, which was then believed to be a type of vessel), and disproved Galen's assertion that chyle was carried by the veins. But, he still believed that the lacteals carried the chyle to the liver (as taught by Galen). He also identified the thoracic duct but failed to notice its connection with the lacteals. This connection was established by Jean Pecquet in 1651, who found a white fluid mixing with blood in a dog's heart. He suspected that fluid to be chyle as its flow increased when abdominal pressure was applied. He traced this fluid to the thoracic duct, which he then followed to a chyle-filled sac he called the chyli receptaculum, which is now known as the cisternae chyli; further investigations led him to find that lacteals' contents enter the venous system via the thoracic duct. Thus, it was proven convincingly that the lacteals did not terminate in the liver, thus disproving Galen's second idea: that the chyle flowed to the liver. Johann Veslingius drew the earliest sketches of the lacteals in humans in 1647. The idea that blood recirculates through the body rather than being produced anew by the liver and the heart was first accepted as a result of works of William Harvey—a work he published in 1628. In 1652, Olaus Rudbeck (1630–1702), a Swede, discovered certain transparent vessels in the liver that contained clear fluid (and not white), and thus named them hepatico-aqueous vessels. He also learned that they emptied into the thoracic duct and that they had valves. He announced his findings in the court of Queen Christina of Sweden, but did not publish his findings for a year, and in the interim similar findings were published by Thomas Bartholin, who additionally published that such vessels are present everywhere in the body, not just in the liver. He is also the one to have named them "lymphatic vessels." This had resulted in a bitter dispute between one of Bartholin's pupils, Martin Bogdan, and Rudbeck, whom he accused of plagiarism. Galen's ideas prevailed in medicine until the 17th century. It was thought that blood was produced by the liver from chyle contaminated with ailments by the intestine and stomach, to which various spirits were added by other organs, and that this blood was consumed by all the organs of the body. This theory required that the blood be consumed and produced many times over. Even in the 17th century, his ideas were defended by some physicians. Alexander Monro, of the University of Edinburgh Medical School, was the first to describe the function of the lymphatic system in detail. Lymph originates in the Classical Latin word lympha "water", which is also the source of the English word limpid. The spelling with y and ph was influenced by folk etymology with Greek νύμϕη (nýmphē) "nymph". ^ "Lymph - Definition and More from the Free Merriam-Webster Dictionary". www.merriam-webster.com. Retrieved 2010-05-29. ^ Mak TW, Saunders ME, Saunders ME (2008). Primer to the immune response. Academic Press. pp. 28–. ISBN 978-0-12-374163-9. Retrieved 12 November 2010. ^ a b Warwick R, Williams PL. "Angiology (Chapter 6)". Gray's anatomy (Thirty-fifth ed.). London: Longman. pp. 588–785. ^ Wisco J. "Lymphatic System". AnatomyOne. Amirsys, Inc. Archived from the original on 18 May 2016. Retrieved 26 October 2012. ^ Yin C, Mohanta S, Maffia P, Habenicht AJ (6 March 2017). "Editorial: Tertiary Lymphoid Organs (TLOs): Powerhouses of Disease Immunity". Frontiers in Immunology. 8: 228. doi:10.3389/fimmu.2017.00228/full. PMID 28321222. ^ Ruddle NH (March 2014). 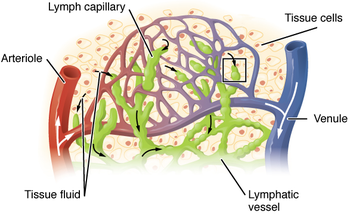 "Lymphatic vessels and tertiary lymphoid organs". The Journal of Clinical Investigation. 124 (3): 953–9. doi:10.1172/JCI71611. PMC 3934190. PMID 24590281. ^ Goldsby R, Kindt TJ, Osborne BA, Janis K (2003) . "Cells and Organs of the Immune System (Chapter 2)". Immunology (Fifth ed.). New York: W. H. Freeman and Company. pp. 24–56. ISBN 0-7167-4947-5. ^ a b Miller JF (July 2002). "The discovery of thymus function and of thymus-derived lymphocytes". Immunological Reviews. 185 (1): 7–14. doi:10.1034/j.1600-065X.2002.18502.x. PMID 12190917. ^ a b Swirski FK, Nahrendorf M, Etzrodt M, Wildgruber M, Cortez-Retamozo V, Panizzi P, et al. (July 2009). "Identification of splenic reservoir monocytes and their deployment to inflammatory sites". Science. 325 (5940): 612–6. doi:10.1126/science.1175202. PMC 2803111. PMID 19644120. ^ Jia T, Pamer EG (July 2009). "Immunology. Dispensable but not irrelevant". Science. 325 (5940): 549–50. doi:10.1126/science.1178329. PMC 2917045. PMID 19644100. ^ Angier, Natalie (August 3, 2009). "Finally, the Spleen Gets Some Respect". The New York Times. Archived from the original on 2018-01-27. ^ Blackbourne LH (2008-04-01). Surgical recall. Lippincott Williams & Wilkins. p. 259. ISBN 978-0-7817-7076-7. ^ "Penicilliary radicles". Saunders Comprehensive Veterinary Dictionary (3rd ed.). Elsevier, Inc. 2007. Retrieved 2011-04-03 – via The Free Dictionary by Farlex. ^ Louveau A, Smirnov I, Keyes TJ, Eccles JD, Rouhani SJ, Peske JD, et al. (July 2015). "Structural and functional features of central nervous system lymphatic vessels". Nature. 523 (7560): 337–41. doi:10.1038/nature14432. PMC 4506234. PMID 26030524. Lay summary – National Institutes of Health. we discovered functional lymphatic vessels lining the dural sinuses. These structures express all of the molecular hallmarks of lymphatic endothelial cells, are able to carry both fluid and immune cells from the cerebrospinal fluid, and are connected to the deep cervical lymph nodes. The unique location of these vessels may have impeded their discovery to date, thereby contributing to the long-held concept of the absence of lymphatic vasculature in the central nervous system. The discovery of the central nervous system lymphatic system may call for a reassessment of basic assumptions in neuroimmunology and sheds new light on the aetiology of neuroinflammatory and neurodegenerative diseases associated with immune system dysfunction. ^ Vittet D (November 2014). "Lymphatic collecting vessel maturation and valve morphogenesis". Microvascular Research. 96: 31–7. doi:10.1016/j.mvr.2014.07.001. PMID 25020266. ^ Heppell C, Richardson G, Roose T (January 2013). "A model for fluid drainage by the lymphatic system". Bulletin of Mathematical Biology. 75 (1): 49–81. doi:10.1007/s11538-012-9793-2. PMID 23161129. ^ Bazigou E, Wilson JT, Moore JE (November 2014). "Primary and secondary lymphatic valve development: molecular, functional and mechanical insights". Microvascular Research. 96: 38–45. doi:10.1016/j.mvr.2014.07.008. PMC 4490164. PMID 25086182. ^ a b c d Pansky B (1982). Review of Medical Embryology. Embryome Sciences. p. 127. 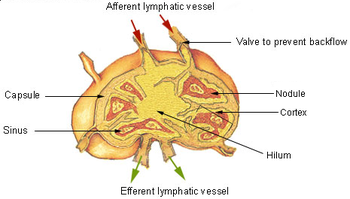 ^ "The functions of the Lymphatic System". lymphnotes.com. Retrieved Feb 25, 2011. ^ a b c Colledge NR, Ralston SH, Walker BR, eds. (2011). Davidson's principles and practice of medicine (21st ed.). Edinburgh / New York: Churchill Livingstone / Elsevier. pp. 1001, 1037–1040. ISBN 978-0-7020-3085-7. OCLC 844959047. ^ Douketis JD. "Lymphedema". Merck Manual. ^ Herantis Pharma (2015-07-21). "Lymfactin® for lymphedema". ^ Martín ML, Hernández MA, Avendaño C, Rodríguez F, Martínez H (March 2011). "Manual lymphatic drainage therapy in patients with breast cancer related lymphoedema". BMC Cancer. 11 (1): 94. doi:10.1186/1471-2407-11-94. PMC 3065438. PMID 21392372. ^ Anthony S. Fauci; Eugene Braunwald; Dennis Kasper; Stephen Hauser; Dan L. Longo (19 March 2009). Harrison's Manual of Medicine. McGraw Hill Professional. pp. 352–. ISBN 978-0-07-147743-7. Retrieved 12 November 2010. ^ a b c d e f g Ambrose CT (July 2006). "Immunology's first priority dispute--an account of the 17th-century Rudbeck-Bartholin feud". Cellular Immunology. 242 (1): 1–8. doi:10.1016/j.cellimm.2006.09.004. PMID 17083923. ^ a b c Fanous MY, Phillips AJ, Windsor JA (July 2007). "Mesenteric lymph: the bridge to future management of critical illness". JOP. 8 (4): 374–99. PMID 17625290. ^ a b c d e Flourens P (1859). "Chapter 3: Aselli, Pecquet, Rudbeck, Bartholin". A History of the Discovery of the Circulation of the Blood. Rickey, Mallory & company. pp. 67–99. Retrieved 2008-07-11. ^ a b Eriksson G (2004). "[Olaus Rudbeck as scientist and professor of medicine]". Svensk Medicinhistorisk Tidskrift (in Swedish). 8 (1): 39–44. PMID 16025602. ^ Turner AL (1937). Story of a Great Hospital: The Royal Infirmary of Edinburgh 1729-1929. Oliver and Boyd. p. 360. ^ lympha. Charlton T. Lewis and Charles Short. A Latin Dictionary on Perseus Project. 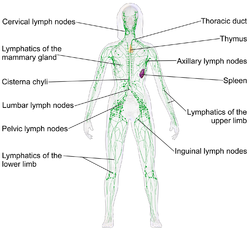 Wikimedia Commons has media related to Lymphatic system.